These iron tubes filled with gunpowder propellant are fired in large volleys; the noise alone could be somewhat unnerving. 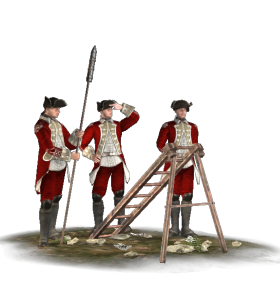 Each rocket is laid in an angled launcher, and it is the job of the artilleryman to correctly judge the angle of launch to drop the rockets in the middle of the enemy. He also needs to take into account wind, as the long tails of the rockets can mean they are blown off course. The least dangerous rockets are tipped with a large spear point, but explosive heads are also fitted. Historically, it was the Indian war rockets used by Tippu Sultan of Mysore that introduced Europeans to the concept. The experience was not a pleasant one. The British copied these weapons as the Congreve rocket system, and used them aboard ships as well as on land. A rocket troop was present at the final defeat of Napoleon at Waterloo in 1815, although accounts of their effectiveness vary. Congreve’s system even included illumination rounds to light up the battlefield! Military engineering is a highly technical field of study, best carried out by trained officers and not left to common soldiery with mattocks!